Days 3 & 4 of Davey’s first birthday week celebration are officially in the history book. On Wednesday, we decided to take Davey to the big boy park near the zoo then to the Runway Café to watch the planes take off and land and to eat lunch. And of course, we couldn’t NOT have a birthday treat, so we stopped at Rita’s Italian Ice for some custard. I chose the big kid park because Davey seems to have zero fear, and thanks to his early walking and climbing, he’s into EVERYTHING! We quickly by-passed the big big kid’s playground and went over to the pre-school arena. I think Davey was a lot more mesmerized with rubber mulch that didn’t seem to move. After passing that fascination, it was on to the slides, the ladders, the toys, the tunnels, the rides and the swings. I think he spent more time trying to climb up the slide and walking up and down the stairs than he did actually partaking in the playground in the appropriate way. After the playground, it was the runway café where Davey had chicken nuggets and sweet potato fries, while watching the planes take off and land and even a helicopter! We stopped at Rita’s to get custard to go as the morning seemed to wipe him out and he was fast asleep in the car. Today was our day of shopping to get any sort of last minute supplies for his first birthday party tomorrow. He was able to pick out an additional toy from his Grammy, along with a book and some clothing. After an action packed morning of riding in the stroller and taking in the sights and sounds, we met my husband at our oldest local bakery which also has a café…Strossners. Davey had chicken noodle soup with cheese biscuits and his very own cupcake for desert. It was a yellow cake, with chocolate frosting and a red dinosaur on top. I suppose I’ve become a bit more relaxed as a mom. I don’t worry about the pointless, like having to clean a shirt, especially when my son’s closet is overflowing with clothes. I don’t worry about a mess that is caused at the restaurant. It’s a part of life having a baby. You can’t expect them to be neat and tidy. So, I wanted to see how Davey would do with the cupcake in front of him. I took the paper wrapping off and placed his birthday eve cupcake on a small plate in front of him. He eyed it for a couple of moments, inspecting the delicious treat teasing him. After a few seconds of tilting his head from one side to the other, he reached in with his left hand and grabbed a huge handful of the red frosting that made up the dinosaur, and much like any child crammed it into his mouth, but not without smearing it all over his face. After that bite, he went in for a second and grabbed even more red frosting. Within seconds, he looked like a mini-me version of the Joker from the Batman movies! We laughed as he reached for the entire cupcake and opened his mouth wide to try to cram in a bite. 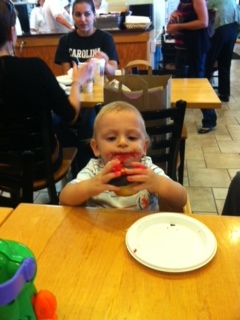 Unfortunately, his eyes were bigger than his mouth and he ended up dropping the cupcake in his lap, then smearing his red-frosting stained hands all over the table. We laughed; he giggled, and pounded more on the table occasionally stopping to pick up a bite of the cupcake his daddy had broken off for him. This evening we are now practicing for future Christmases. Davey is already in bed and we’re up putting together toys and wrapping packages. I can’t wait to see the look on his face in the morning, but I’m also a teary-eyed mama as I think about how quickly his first year has gone by. Will the rest of his years fly this quickly? If so, I’d better hold on tight and take my chance to spend every waking moment with him.